Stimulating, warming and comforting. This popular spice was originally native to the Molucca Islands and is now cultivated for its essential oil in Indonesia, Sri Lanka and the West Indies. 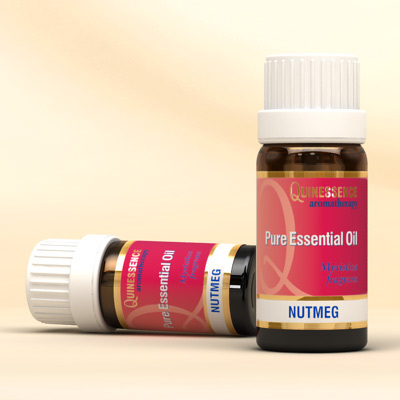 Nutmeg Essential Oil has a fresh, warm and spicy aroma with woody undertones that resembles the spice, although this can vary considerably according to the country of origin. Our preference is for the aroma of Indonesian nutmeg oil which is less sharp and terpenic than other origins. Nutmeg Essential Oil has a warming and soothing effect on overworked muscles, joints, and muscle spasms when used in massage blends, or when massaged on the abdomen to ease menstrual cramps or digestive discomfort. Anywhere that you need to stimulate the circulatory, cardiovascular or digestive system, Nutmeg oil is a good choice since it is classified as a tonic. Nutmeg Essential Oil contains myristicin, a natural organic compound that has been proven in research to boost cognitive power, improve memory, and inhibit an enzyme in the brain that contributes to the development of Alzheimer’s disease. * Nutmeg oil is refreshing and stimulating for cases of mental fatigue, helping to increase energy and improve concentration and efficiency both at work and in study.